It’s an argument self-proclaimed liberals and progressives love to trot out – why be concerned about Islamist terrorism if you’re more likely to be killed by furniture or toddlers? It’s an argument that superficially makes sense on the face of it – if you’re concerned about threats, know the numbers. 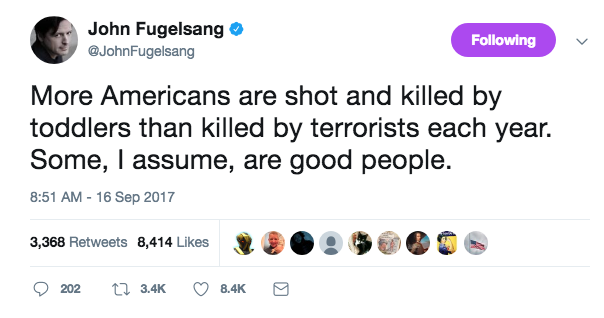 This is a sentiment recently echoed by Sirius XM host John Fugelsang, pointing out that toddlers kill more people on average than Islamic terrorists every year. The particular point Fugelsang was making had more to do with gun control than Islamic terrorism per se – and I suspect on the subject of guns there is probably hardly any daylight between my views and his own. But the basic premise that both Aslan and Fugelsang seem to make, either explicity or implicitly, is that our fears of Islamic terrorism are overblown – by the numbers, it’s just not a big deal. If you are scared of Muslims then you should also be scared of household furniture and toddlers: A study carried out by the University of North Carolina showed that less than 0.0002% of Americans killed since 9/11 were killed by Muslims. (Ironically, this study was done in Chapel Hill: the same place where a Caucasian non-Muslim killed three innocent Muslims as the mainstream media brushed this terrorist attack off as a parking dispute). Based on these numbers, and those of the Consumer Product Safety Commission, the average American is more likely to be crushed to death by their couch or television than they are to be killed by a Muslim. As a matter of fact, Americans were more likely to be killed by a toddler in 2013 than they were by a so-called “Muslim terrorist”. 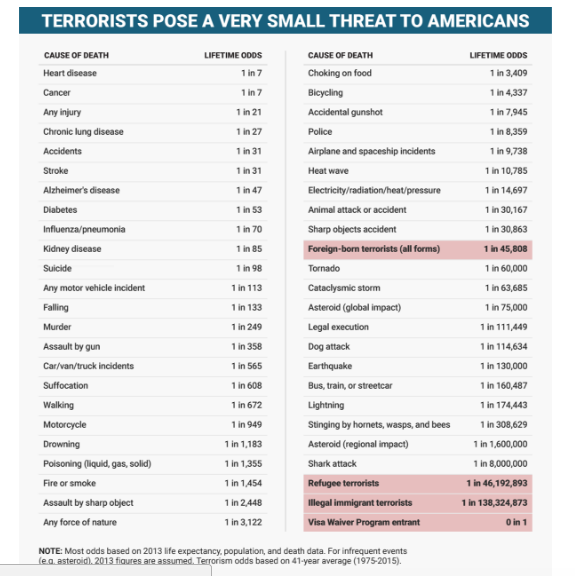 One need only look similarly at comparisons to the medical maladies that tend to kill Americans in huge numbers like heart disease or cancer to see more reasons to think that this view on the overblow threat of terrorism seems somewhat justified. Your risk of heart disease is 1 in 7, whereas death by a foreign born terrorist is 1 in 45,808. On the face of it, this really isn’t a terrible argument. Why is this such a big deal. We should relax. There are two big problems with the presentation of this argument – one rooted in dishonesty, and the other in hypocrisy. 1) 9/11 is almost always left out of the statistics. When you start looking at terrorism statistics trying to wade through some of the claims regarding both foreign and domestic terrorists, one of the points of utmost dishonesty practiced by many media outlets is conveniently leaving out the attacks on 9/11 from the statistics. The headline will read something like “Since 2001, deaths have been…”, and suddenly the threat of Islamist terrorism seems fairly overblown and our concern grossly out of proportion, relative to attacks carried out by domestic rightwing extremists. Put 9/11 back in, suddenly the threat of Islamist terror attacks dwarfs that of right-wing extremists. 2) Even if you leave 9/11 out, all these threats are more deadly than the other terror security threat – right-wing extremism, Neo-Nazis and White Nationalists. With the recent death of Heather Meyer in Charlottesville, and Neo-Nazis marching to protect Confederate monuments, one need not look far to see the rising tide of White nationalism as a threat. And yet based on most all metrics that Aslan and Fugelsang use to diffuse the fear of Islamic terrorism, White Nationalism similarly comes out, for lack of a better word, overblown. It appears that both Aslan and Fugelsang contradict themselves in this regard. They seem very very concerned about the rise of right-wing extremism – a sentiment I share with them. White nationalist movement growing much faster than Isis on social media https://t.co/WE9NlzoZlO Our ignorant bigots are bigger than theirs! 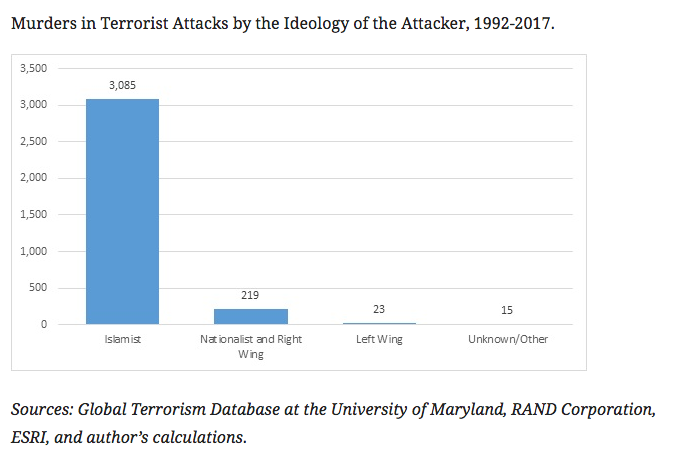 If we leave 9/11 in our calculations, as shown in the chart above, Islamist terrorism is more concerning by an order of magnitude than Right-wing terrorism. 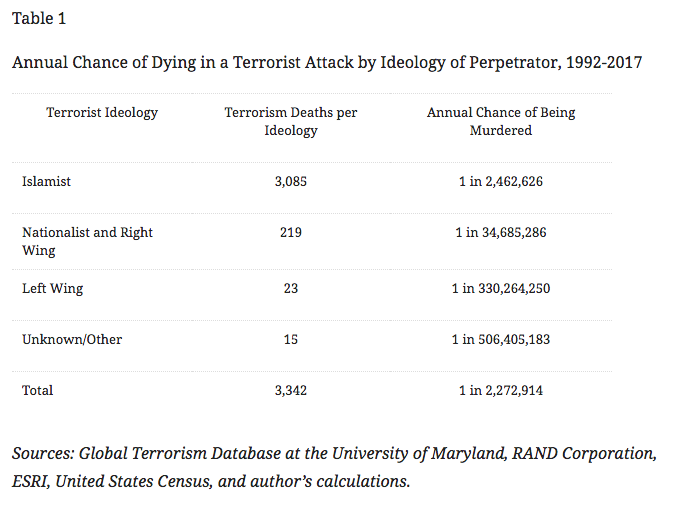 If we take the average from 1992 to the present day, the odds of being killed by an Islamist are 1 in 2.4 million vs. 1 in 34 million for right-wing extremists. And if we leave 9/11 out of more recent calculations, we see the two are actually comparable. 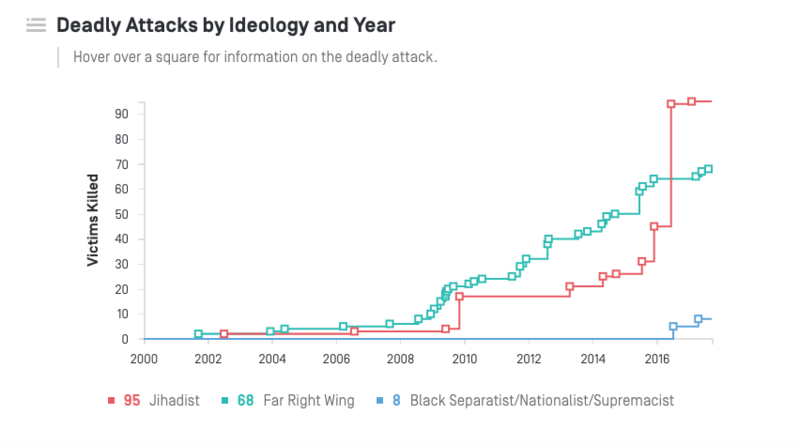 Despite the claims of many that there are far more right-wing attacks in the United States, with the Orlando shooting Islamist attacks recently over took them. The truth of the terror statistics leads to one of two possible conclusions. 1) If the threat of Islamic terrorism is way overblown, so are our fears of Nazis and White Nationalists, and like regressive critics we should start ridiculing anybody expressing concern over them (“After all, you’re more likely to die from faulty furniture”). 2) If White nationalism, White supremacy, and the terrorism they inspire are real concerns – and they undoubtedly are – then Islamist terrorism is even *more* concerning, and both need to be taken deathly seriously. That you’re more likely to die from heart attacks or faulty furniture actually isn’t the measuring stick by which you decide to start being concerned. By that logic, we should stop caring so much about White Nationalists and Neo Nazis marching through our streets – an absurd idea that none of us would dare entertain. Would you tell anyone who feels threatened by the more pronounced presence of White Nationalism that they’re being silly for feeling this way? “You’re more likely to die from faulty furniture, so stop worrying about White Nationalists” would be an appalling thing to say to the mother of Heather Meyer in the wake of her death in Charlottesville. The constant incantations of this logic by some leftists in the wake of every new Islamist terror attack is equally fallacious, tone-deaf, and harmful, regardless of its good intentions within the Church of Intersectionality. Lynch is a writer and blogger who got his start writing for Carlos' Watson's "The Stimulist" when Watson was then an MSNBC anchor, invited to join by a then unknown, now world renown author Taiye Selasi. His interests include Science, Religion, Culture, Politics, and the Arts. Censorship has crossed over. The left reaps the whirlwind.